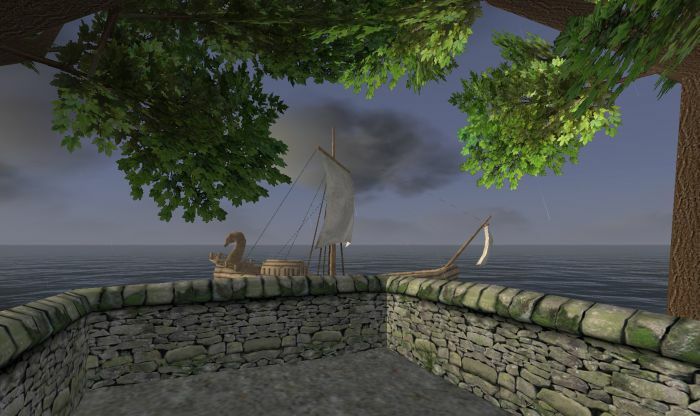 Sailing in a Gale #WurmOnline – Nomadic Gamers, eh! I purchased my first ship yesterday, a lovely Corbita. I decided it would be much easier to bring items between my two deeds, plus there were all those logs I wanted to take back to Les Reveur, as well as some dirt, sprouts, and clay. I learned some pretty important things about ships, this being the first one I’ve ever sailed. Number one, the wind is always going to dictate (at least for my ship) where you go. No wind means you’re going no where fast (again, on my ship. Other ships are different). I tried to fight a gale early on in the morning. I slugged along at 1km/h. BAD idea. I waited until the wind died down to a breeze, and slugged along at 4 km/h. With the gale at my back, I was reaching speeds of easily 24km /h and sailing right along. In fact I was sailing so well that when it came time to dock I crashed and found myself up in the market area of Fippy Harbor. Whewps. It took me about 30 minutes to push and pull the ship back into the water instead of on land, and while I’m talking about my misfortunes lets not forget that I dropped my anchor into the water, twice, and had to frantically swim after it while praying that my ship didn’t sail away. Yes, it was quite an adventure. That being said, when the wind is favorable, the speed is fantastic, and there’s no better way for me to move between my two deeds. At this moment I have 300 items or so loaded into the ship, it can hold 100 rafts, and each one of those rafts can carry 100 items. I have .. 5 rafts. I’ll have to work on getting more. It looks like Jackeen may be moving into my little area, which is fantastic. I’ve been trying to help him find a deed, and given him refuge in my own villages in the mean time. I’m hoping to post some before / after pictures of Les Reveur before too long. The new trees I planted are coming in nicely, and the deed is a LOT better now than the condition I found it in. I’m also just a short bit away from being able to convert into a priest of Fo, which is something I’ll talk a lot more about once I get there. I don’t play WurmOnline but I love reading your posts about it. This one flat cracked me up! Reading your posts makes me want to try it but I know it’s not the game for me. Enjoying your blog! Ah, oh well, it was a bit much to hope for in an MMO…that they’d put in a whole boat simulator. It still sounds really fun though! Thanks for the info! I’m not sure about other ships, for mine it’s just a matter of steering, and finding the ‘sweet spot’ with the wind. And not dropping the anchor when I try to moor. Again. I can also take on passengers, and they do help my speed since I have oars, but they don’t have to actively do anything. How much control do you have over the running of your ship? I mean, how much of a sailing simulator is it? Can you haul in, or let loose, the sails? Or is it just a matter of steering? I’m fascinated… I come from a family of sailors, y’know. Though I didn’t get much of that gene.